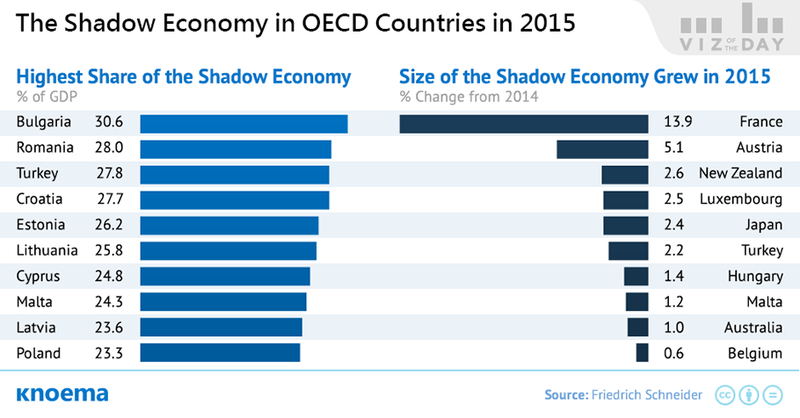 The $9.7 trillion global shadow economy is the second largest economy in the world after the United States, according to the 2010 estimates of the black market for 162 countries. Still, as for the more recent study, the size of the underground economy in European and other OECD countries have been decreasing steadily since 2009 and continued shrinking in 2015 averaging to 16.7 percent of official GDP. But this development was not uniform across individual countries: 10 out of 36 OECD countries experienced an increase in the black market size in 2015. The most significant upsurge of the unreported share of economic activities was observed in France, Austria, Luxembourg, and Japan. All of these countries saw an increase of individual income tax rate in the last two years that is one of the driving forces behind the expanding of the shadow economy.